Steak and potatoes? A no brainer. But with a few easy steps you can take this classic combo from staple to sublime. We consulted our expert chefs to get the latest intel and approaches. Here’s how you can make the perfect steak and Creamer potatoes—the art uncovered! This may sound obvious, but it will make all the difference. Start with the best, if you can: fresh, not frozen, and, ideally, hand-cut. Experts like the bone-in rib-eye. Dry-aged (minimum 60 days) and grass-fed is optimal—the true connoisseur’s choice. Ditto for the potatoes when it comes to quality. While the ubiquitous russet are typically dry and bland, Creamers are loaded with naturally buttery flavor. Blushing Belles are especially velvety, with an appealing red, and slightly sweet, thin skin. Overall, respect the meat and the grill, and take your time, the experts say. Patience, grasshopper! Key is to let the meat come to room temperature before you grill (about 15 to 20 minutes). Cold beef means uneven cooking times, and burned outsides with cold centers. Salt the meat generously as it warms up to room temp. When the temp is five degrees from your optimal, take the steaks off the heat, put on a plate, cover with foil and let ‘em rest five to 10 minutes before serving. That’s to lock in maximum tasty juiciness. Don’t rush this step. For the Creamers, charred potatoes add an appealing rustic element to your dish, plus look festive on skewers—and couldn’t be easier to prepare. Add color by mixing yellow and blue Terrific Trio Little Potatoes with orange peppers and red onions. Also de rigueur are smashed potatoes, the latest chef’s darling. Try this recipe for Smashed Potatoes with Almond Butter and Peppered Steak. All that’s left is to add is a green salad and full-bodied red wine. Bon appétit! Consider a garlic-thyme butter for a gourmet twist. Mold the soft butter mixture into a plastic wrap log, chill and slice off disks. Place on to the warm steak to melt just before serving. Heaven! That said, chef Gordon Ramsay prefers to baste steaks with butter while cooking for a “nice nutty brown finish.” Grill guru Bobby Flay, on the other hand, is a purist: just oil (on the meat itself) + S&P. That’s it. And now, be sure to invite some friends over so you can impress them with your steak-and-potato prowess! 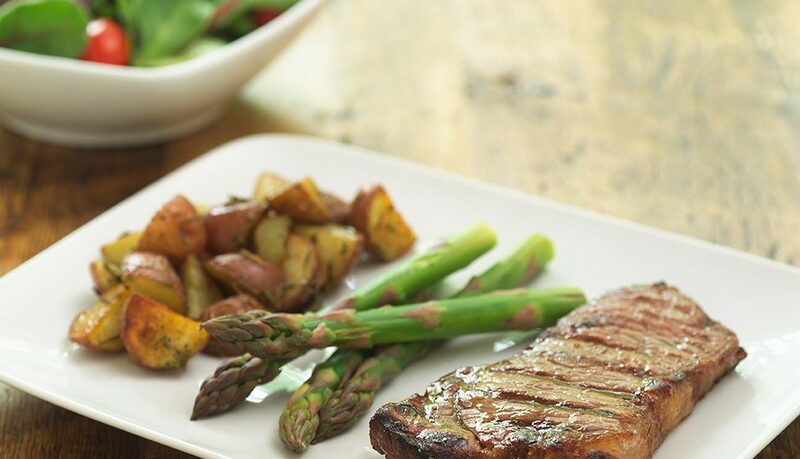 WHAT’S YOUR SECRET TIP FOR THE BEST STEAK AND POTATOES? DISH!